This autumn sees the launch of the Breeze Art & Makers Fair at West Cornwall’s beautiful Trereife House, an event which will showcase the very best designer-makers and artists in the region, with three days of exhibitions, workshops, talks and demonstrations. Previously known as the Cornwall Design Fair, Breeze will profile the finest luxury craftsmanship and contemporary art, presenting the work of over 45 selected artists and makers, including silversmiths Brett Payne and Fenella Watson, ceramicists Paul Jackson and Richard Phethean, sculptors Richard Holliday and James Eddy, jewellers Emily Nixon and William Blaikie and glass artists Antonia MacGregor and Helen Eastham, and exhibiting collections from ten of the South West’s leading art galleries, including Circle Contemporary, Yew Tree Gallery, Makers Emporium and Guild of Ten. We are partnering with the Saffron Trading Company and are holding a permanent stand at The Guildhall in St Ives. This is a exciting place to come and try the Jewellery on, we will be offering repairs, bespoke service and promoting our summer workshop classes. The Wylde Wednesday Market is held every Wednesday 10am - 4pm from 28th March through to 31st October. We will be opening our Studio W12 at the KROWJI to the public for a Christmas shop! 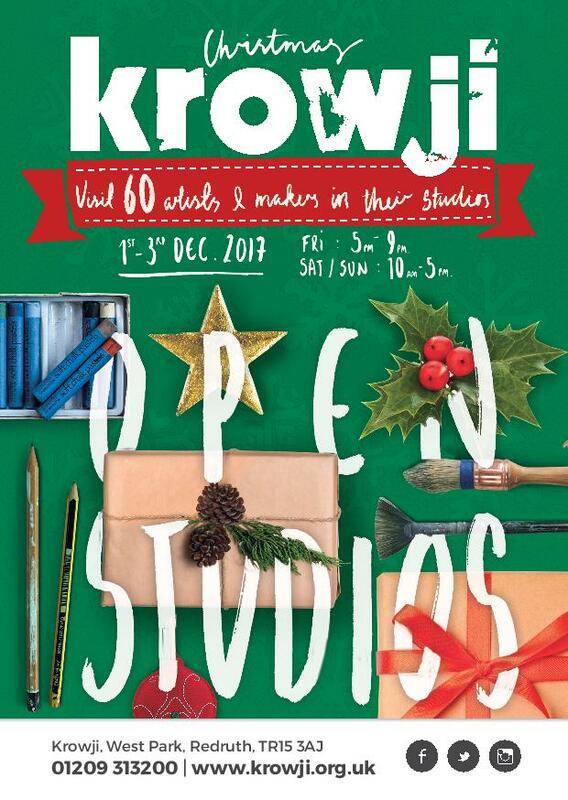 The artists and makers at Krowji, Cornwall’s largest creative hub in Redruth, are throwing open their studio doors again on the first weekend of December to give visitors the opportunity to see behind the scenes, meet the makers and purchase art, crafts and Christmas gifts. The event will begin on Friday evening with festive entertainment and a complimentary mince pie and mulled wine. The Melting Pot Café will be open throughout the event serving a range of refreshments. One Year On is a destination feature within New Designers that presents young, entrepreneurial designers who are in their first year of business. It runs across both Parts of the show and covers all disciplines. Those that exhibit go through a selection process, and are chosen on the strength of their work, flair and quality of product. One Year On is the place to go to buy directly from the selected designers and invest in the iconic furniture, fabric, jewellery and ceramics of the future. Start Up The Contemporary Crafts Fair. Find us on stand D7 START UP. Come along between Saturday 27th May – 4th June to enjoy a day out at Krowji. MAMM + MYRGH Goldsmiths are located in W12 studio half way up the stairs from the front entrance, we share the studio with Rachael Osborne a very talented Silversmith. Handmade in Britain will return to Kew Gardens for the second edition of HANDMADE AT KEW! Over four days, the picturesque gardens at Kew will showcase exceptional and innovative British and international craftsmanship, for both fashion and interiors. Handmade at Kew is a very special chance to invest in beautiful, unique products at a show where you can buy, browse and commission directly from the maker; unearthing the stories, inspirations and processes behind the exquisite work of some of the world’s most talented craftspeople. The event is housed in an elegant pavilion next to Kew Palace and this unique setting allows you to enjoy the Gardens and crafts to the full. It’s a truly a unique shopping experience and great day out for all the family. Cornwall Design Fair has become a unique opportunity to find out Cornwall’s esteemed artists and craftspeople approach their work, and discover first hand the inspiration behind each piece. The event epitomises the essence of design quality and creativity, making it the place to go for innovative and beautiful items for your home and for yourself.